Can we talk for a sec about how awesome Doctor Who Season 8 was? With standouts like "Listen," "Mummy on the Orient Express," "Flatline," (not to mention the whole Missy arc), Peter Capaldi's first season on the cult classic show is easily one of the best in years (yeah, I said it). Doctor Who season 9 returns on September 19th (just a little over a week away), and it's already got a lot going for it. 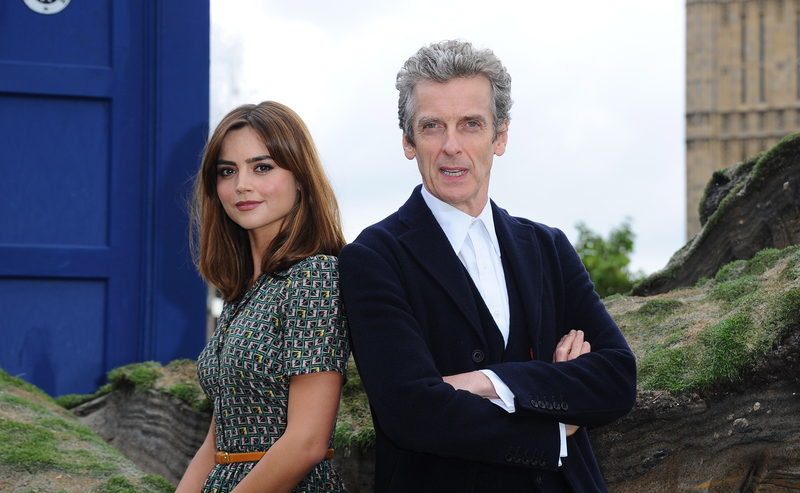 First off, both Capaldi and Jenna Coleman are returning. Add that in with the fact that Michelle Gomez and Maisie Williams will be making guest appearances, and you've got yourself a lot to look forward to. Killer casting aside, I'm a longtime admirer of the fashion of Doctor Who — and Clara Oswald has some on point personal style. So what better way to celebrate Who's impending return to our televisions than with some Clara-inspired shopping? Luckily for us, Clara's on-point fashion sense just happens to be perfect for the fast-approaching autumn — all you need are some retro-inspired dresses (preferably with the occasional contrast collar), a good military-esque jacket or two (or three), and some high-heeled booties that you can really run/walk/look fabulous in! Not quite sure where to start? Here are a few shopping options to get the ball rolling.